I have been doing some cards on request from work colleagues - I think they are just wanting to see what I come up with each time and I am loving the challenge. This is a birthday card for a 20-something girl. 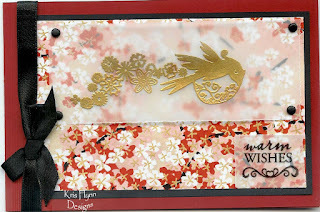 I drew some inspiration from the recent Creative Cardmaking & Papercraft magazine where they used vellum and Japanese inspired paper. I thought stamping on vellum would be a bit tricky, but it was so easy. I just used versamark ink and gold embossing powder.